ROMANIA: Protestors were yesterday injured by rubber bullets in extraordinary scenes during a protest against a Czech wind farm project. A group of residents from Cogealac village, around 250km from the capital Bucharest gathered to support mayor Adrian Ropotan in his attempts to deliver a fine to Czech power company CEZ. Guards at the construction site said they fired rubber bullets in defence, according to the local head of police. Four protestors suffered leg injuries and one was hit in the stomach. Ropotan claims that CEZ violated planning rules by starting work on the 240 turbine wind farm. He says that Spanish renewables company Iberdola, rather than CEZ, had been granted permission. 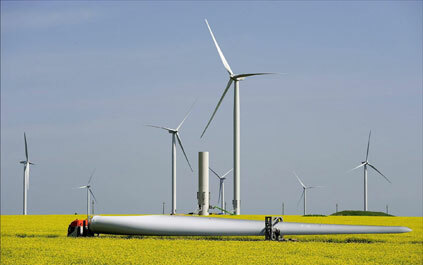 Romanian law, permits wind farms to be built with permission from county authorities, while village permission is not required if the farm is not being constructed in a built-up area. Iberdrola opened an office in Bucharest in 2009 and said it was building a wind farm in Cogealac. Project manager Ondrej Safar told daily newspaper Adevarul that "there is no real reason for this project not to be finalized. ... We are fulfilling the legal and technical requirements."